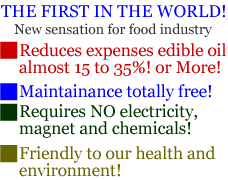 Mr. Die-Hard| It reduces expenseses edible oilr almost 15to 35%! or More! We at Sato Company have developed "Mr. Die-Hard"- an oil activator that reduces the cost of edible oil by 15 - 35%! 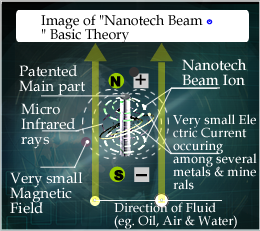 Mr. Die-hard is the ANSWER of Nano Tech-Beam Theory on oil activation! with the help of Kanazawa University. 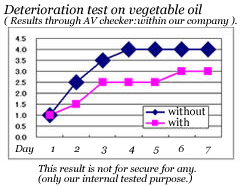 Edible vegetable oil becomes lighter, smoother and crisper. 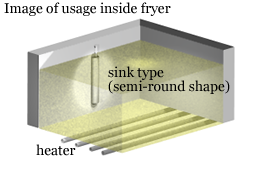 Fryers for business use prove outstanding saving efficiency! Frying is done to a turn! Latest product: Mr. Die-hard ---Outer- attachment type!! We proudly report that demand of Mr. Die-hard at food production factories made us add this latest product. 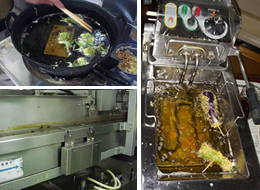 We can offer 2 main types, sink-type and outer type accroding to how to use of oils and it's volume..
A miraculous product with nanotech promises to bring change to food industry! “Mr. 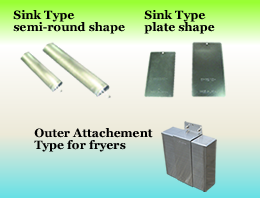 Die-hard” Attachment type for fryers. 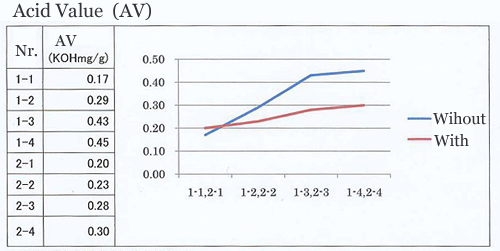 Examination result by Univiersity and public testing labo. We brought Mr. Die-hard into University to be tested. After their close examinations using corn oil purchased at the market together with Mr. Die-hard, they could only confirm conspicuous results. Comparison: with and without Mr. Die-hard. This test is based on continued use of oil for days, 8 hours a day. With Mr. Die-hard, the derived value of oxidization of oil after the third day remains 2.5, whereas without it, after the 2nd day, the value reaches almost the highest (the worst) of oil’s oxidization. with the help of Kanazawa University. The same is true with oxidization.